The 8th Annual Rails to Trails Greenway Sojourn started off on a sticky Sunday Morning from Wiggins Waterfront Park in Camden. At 9:00AM 350 participants gathered at the raised platform at the end of Cooper Street to hear some words from Rep. Rob Andrews and Camden County Freeholders Ian Leonard and Carmen Rodriguez. Andrews remarks focused around the reception of the TIGER and the positive effects that the proposed improvements will have in Camden and the connection to the rest of the region. 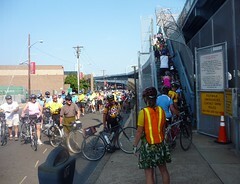 After the brief ceremony bicyclists proceeded up Pearl St to the Ben Franklin Bridge walkway steps across from the back entrance of Rutgers University. Where a long queue developed as everyone had to negotiate the three story stair tower. It took 45 minutes for everyone to climb up to the walkway, a delay that will dwindle down to about 5 or 10 minutes once a new ramp is constructed by the Delaware River Port Authority (DRPA). As it turns out DRPA closed the walkway for a much longer period than what was needed. It was scheduled for a 9:30 AM delayed opening based on the assumption that earlier Tour De Shore ride was going to use the walkway. When participation exceeded 1000 the DRPA granted a rolling closure on the road to the event, negating the need for a pre 9AM closing. The North Walkway which would have been a great alternate for other bridge walkway users remained closed. DRPA Police officially opened the walkway after the last straggler crossed the bridge at 10:22 AM. Imagine the reaction that closing the bridge roadway with no alternate route for four hours would have generated. Camden's LEAP Academy Charter School received a scholarship to send 15 of its students on the 8 day sojourn. They are being accompanied by two League Cycling Instructors Andy Besold and Nate Davis who provided instruction for New Jersey's Bike School program at Farnham Park in 2009. 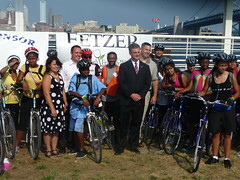 Posing with LEAP Academy Riders are left to right-Camden Co. Freeholder Carmen Rodriguez, Coopers Ferry Dev. Corp. Director Anthony Perno, Congressman Rob Andrews, Freeholder Ian Leonard.